Paris After Dark by Jordan Summers is the kick-off story in The Mammoth Book of Vampire Romance 2 anthology and if it is a typical indication of the quality of the stories in the collection, then this is going to be a rewarding reading experience. Rachel is an American detective, vacationing in Paris, despondent over the recent loss of her partner on the job for which she feels misplaced guilt. Witnessing an assault, Rachel reluctantly decides to intervene only to be attacked herself and in the process she is bitten on the arm and the assailant makes off with a sentimental keepsake from her partner. 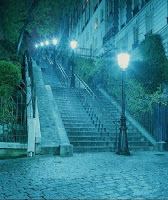 Pursuing to recover her memento, she loses the trail but instead meets Gabriel in the Parisian catacombs who assists her to the hospital and back to her hotel. Unknown to Rachel, Gabriel is a vampire and enforcer for the High Council tracking a vampire serial murderer, the very one that Rachel encountered. A romantic relationship develops in Paris After Dark between Rachel and Gabriel as they work to stop the killer before there are more victims. The killer taunts Rachel and she learns some news about the circumstances of her attack that will change her life forever. Gabriel too makes a devastating discovery in his own life. Expertly paced and plotted, Paris After Dark packs a novel’s worth of story into a few short pages with romance and thrills making for a thoroughly enjoyable opening tale. 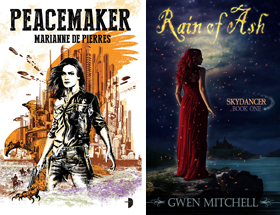 Jordan Summers: With sixteen published books to her credit, her latest series is the Dead World trilogy, featuring Red, Scarlet and the forthcoming Crimson (November 2009). Sounds like a collection to look out for, for me and my son. Sheila the next story reviewette will be up today and on each succeeding day until the collection is complete. I always like Telep's collections. More winners than losers. heidenkind next time you visit you should try and pick it up. Always great collections from Trisha Telep.